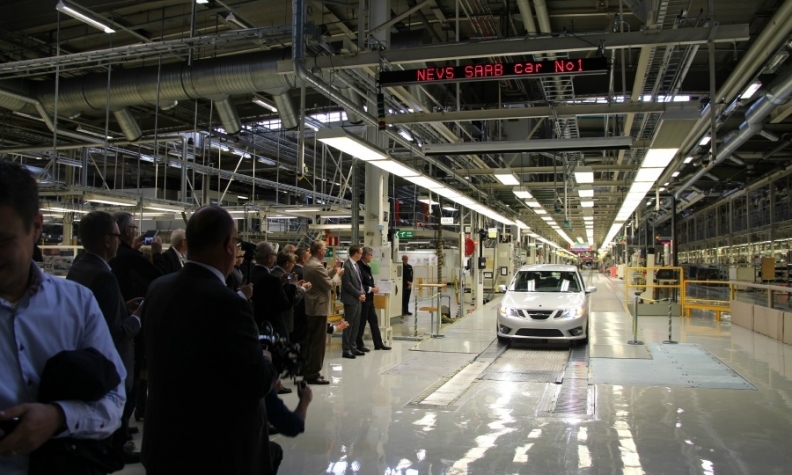 NEVS' first Saab 9-3 car leaves the Swedish assembly line in September 2013. Production was halted in May. STOCKHOLM -- India's Mahindra & Mahindra has agreed to buy a majority stake in National Electric Vehicle Sweden (NEVS), the investment group that bought the assets of Saab Automobile two years ago, a report said. NEVS' administrator, Lars Eric Gustafsson, said today in a statement that an Asian carmaker has agreed to purchase a majority stake in NEVS. Neither Gustafsson nor NEVS identified the company. The website SaabsUnited said NEVS and Mahindra have signed an agreement for Mahindra to step in as majority owner of NEVS. The agreement is being kept secret until it is finalized the website said. Gustafsson's statement said the Asian carmaker agreed on Nov. 30 to the deal and to finance the company’s operating costs until the agreement is complete early next year. Gustafsson also said that NEVS is in talks with another Asian manufacturer on a joint venture to develop new vehicles. NEVS, a Chinese-Japanese investment group led by renewable energy power-plant builder National Modern Energy Holdings, sought protection from its creditors in August after struggling to deliver on a target to produce 120,000 cars a year by 2016. That would have come close to the Saab brand’s 2006 peak annual ouput of 133,000 vehicles. The potential majority shareholder has offered to provide bridge financing of 5 million euros ($6.2 million) a month to cover operating costs until the agreement is complete, NEVS said. Pending due diligence, the company said the deal should be finished by February. NEVS was granted permission by a Swedish court on Aug. 29 to carry out a reorganization of the company. It applied today to Vaenersborg District Court to extend the reconstruction period by three months. NEVS said it had trouble paying its creditors after its shareholder, Qingbo Investment Co., didn’t fulfill a promised investment of 1.15 billion kronor ($155 million). Saab was previously owned by General Motors Co., which acquired full control in 2000, before selling it in 2010 to Dutch supercar maker Spyker NV, which failed to revive the brand. The auto business split from Saab AB’s aerospace operations in 1990. Gustafsson's statement said the majority owner will negotiate with Saab AB to use the Saab brand name and badge. Saab AB withdrew permission after NEVS applied for creditor protection. NEVS expects to be able to renegotiate the Saab brand agreement following a solution to its funding troubles. Swedish newspaper Svenska Dagbladet reported on Aug. 5 that NEVS was in talks with Mahindra & Mahindra and China’s Dongfeng Motor on funding, citing unidentified people with knowledge of the talks.